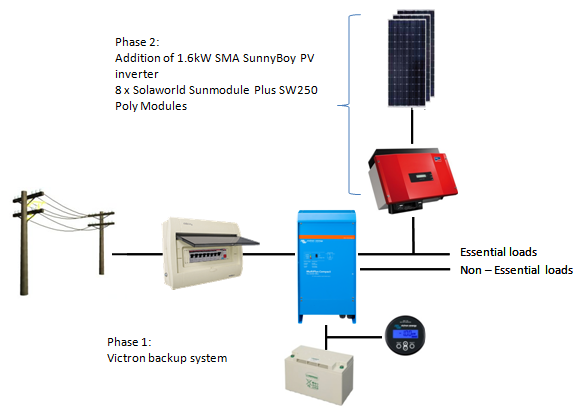 System is ready for a 5kW PV solar system. 5kVA battery inverter for essential loads with 600Ah battery backup (28.8kWh, or 14.4kWh at 50% DOD). Battery cycle life of 2200 cycles at 50% DOD. Supplement your household loads up to 5kW peak PV power. Daily Energy 24kWh to 27kWh per day irradiation dependent. 5kW Grid-tie Inverter synchronizes with AC grid to provide power for self consumption and/or grid feedback. Addition of Victron colour control for local system monitoring and Web / Android / iPhone viewing.